In the first meeting with Woes we already talked about it, maybe it even was the first thing that came to mind. I can’t really remember how the idea popped up. Sometimes it just creeps up on you and all of a sudden it’s there. Like in this case. 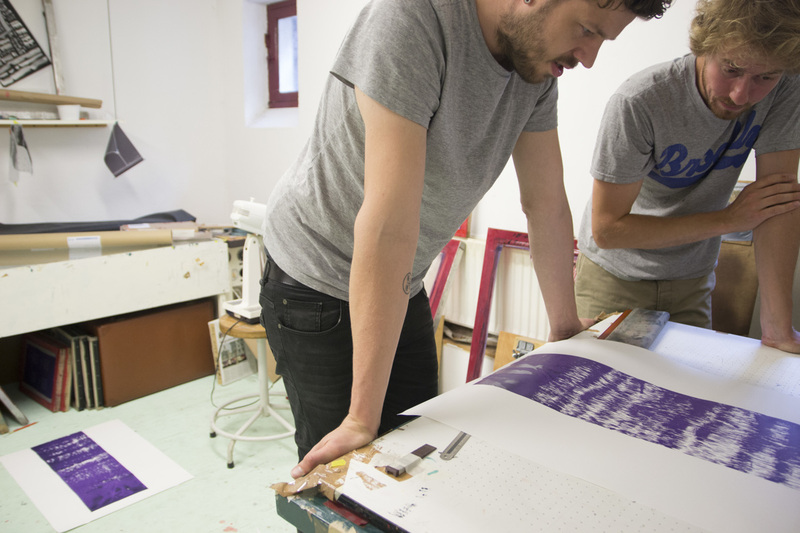 We wanted to make an installation that produces a never ending gradient or ‘iris’ print. 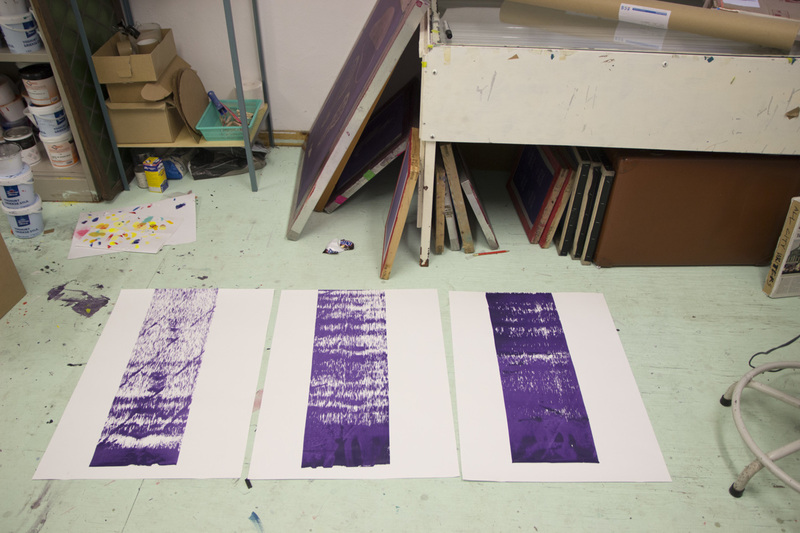 As the print is ‘never ending’ you have to constantly add ink. 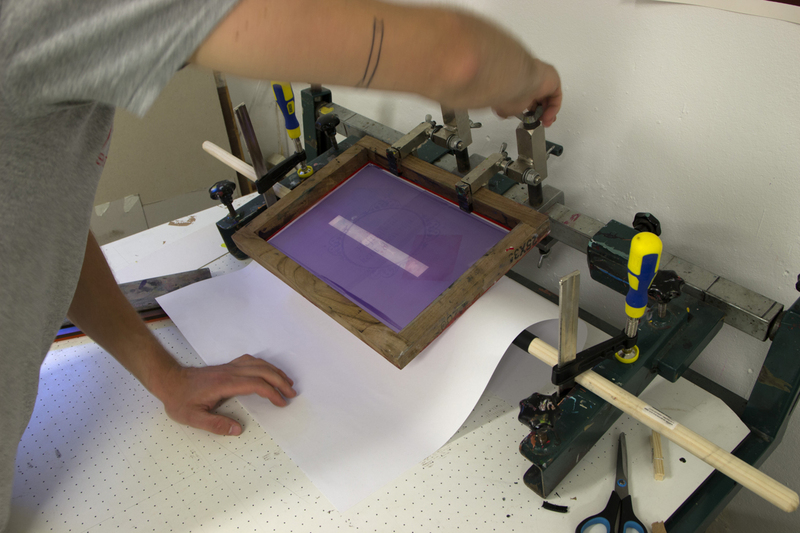 When adding different colors the pressure of the squeegee ‘mixes’ them on the silkscreen, pressing a gradient through the mesh onto the paper in a natural way. If you constantly add different colors, the gradient changes. 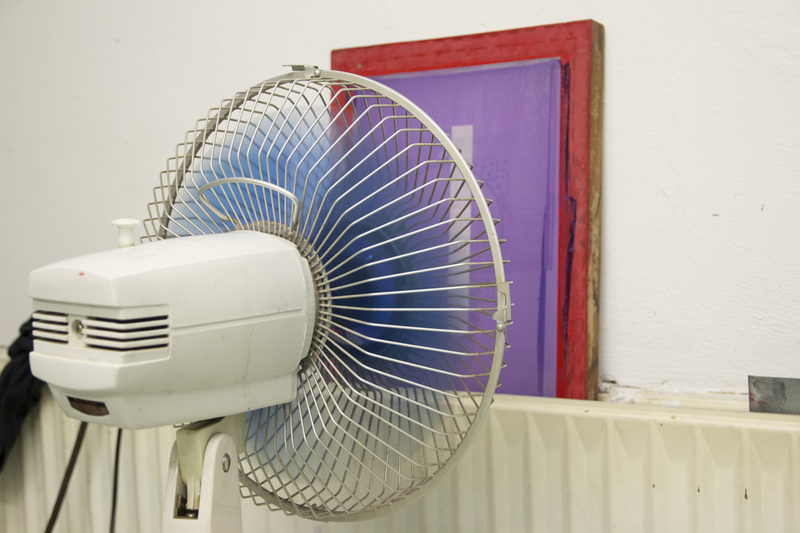 For this you only need to lit a small slot on the silkscreen (only one time). For an ‘endless print’ the paper should be on a roll. 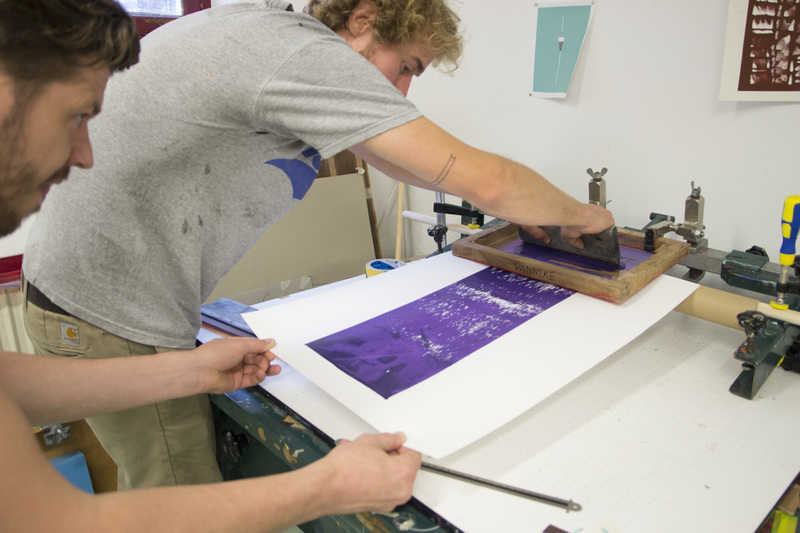 The ink should somehow flow under the locked squeegee to produce the print, and have the right amount of pressure. 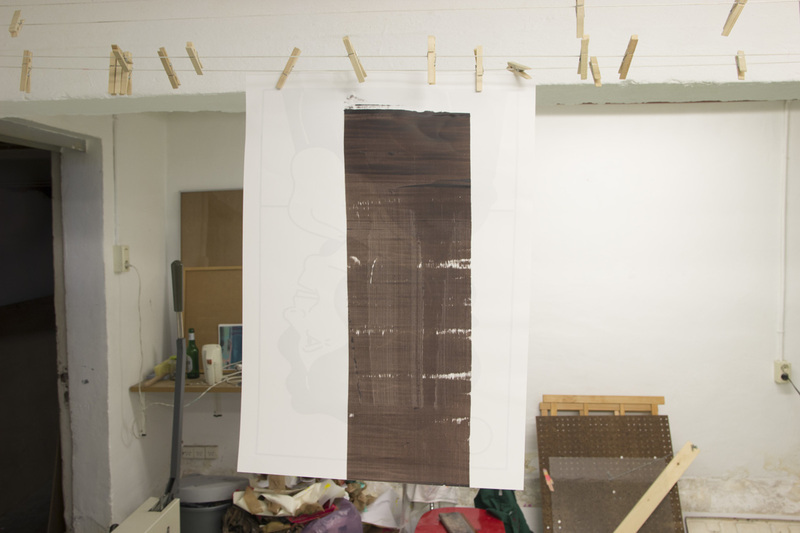 And the paper should be pulled from under the silkscreen at a slow and steady pace.
) We liked the idea of building an installation. We were curious what the result would be when adding different inks, and if we could make it work as a whole. We also find the idea of making an abstract image (instead of something more illustrative) appealing. We realised this was not going to be easy and quite technical, so we started with a simple experiment. We decided to get a broom, put a cardboard pipe around it and locked the whole thing using glue clamps. 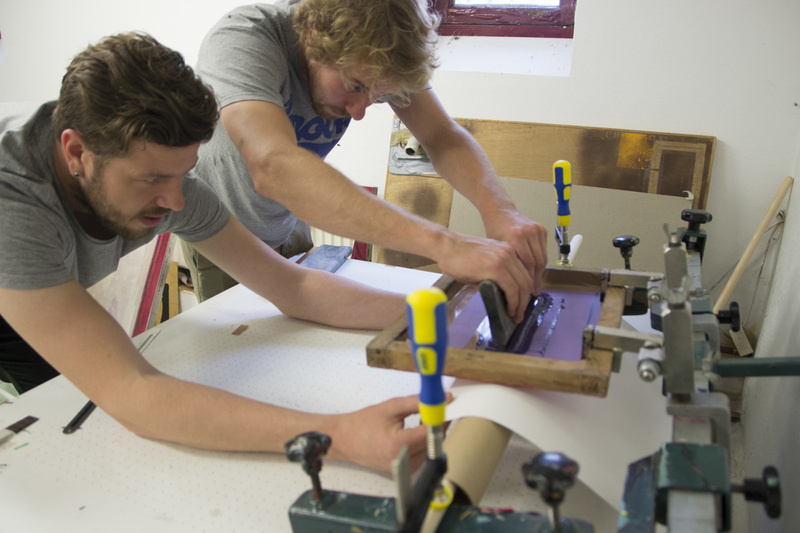 Felix had some extra silkscreen clamps lying around, so we used those to attach the screen on the table. 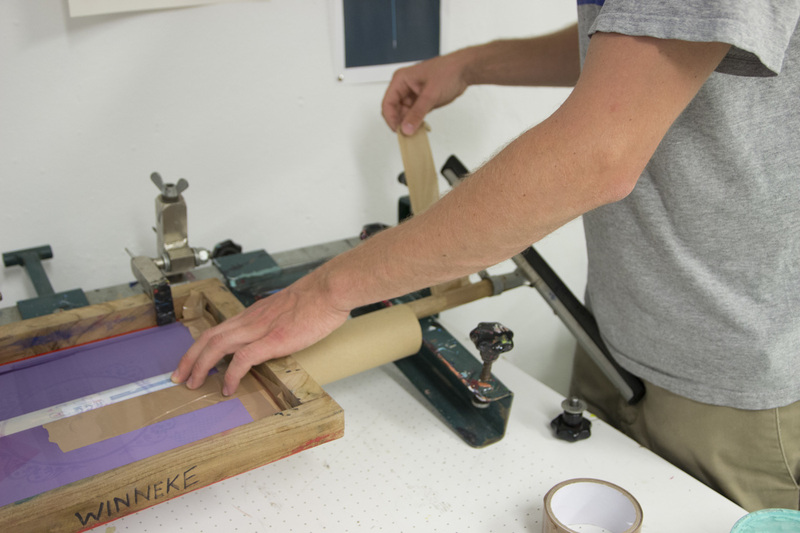 The goal is to make a print by pulling the paper from underneath, while keeping the squeegee in a fixed position. Ideally, the outcome would be a long, solid print. The first experiments resulted in a print with a quite nice pattern, but not really satisfying. We would have to adjust some things to hopefully get closer to our desired outcome. We figured the cardboard was the main reason the pattern would come out like it did, so we added a soft surface to the roll. 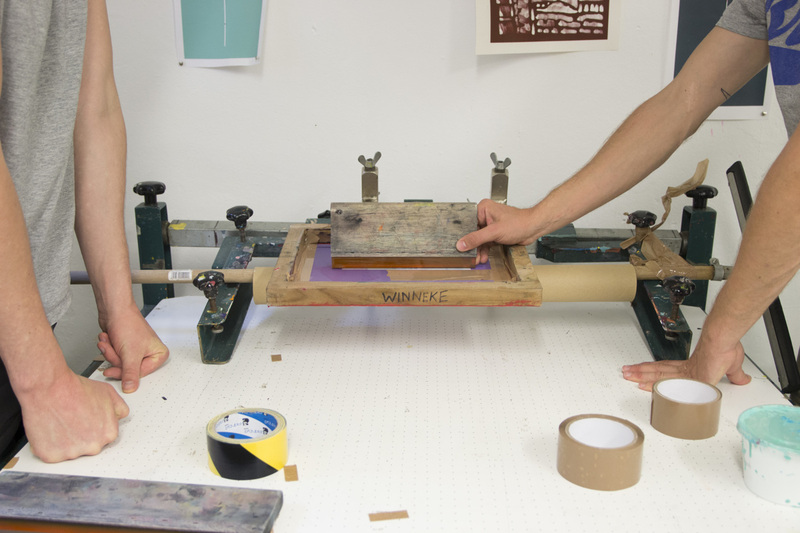 This way, the squeegee would dig a little deeper into the paper and hopefully produce a solid print. A bicycle tire pulled around a broomstick should suffice. Adding a bicycle tire to the broomstick. This will probably work. As you can see from the images, it worked. But while working on this solution we figured that even when such a crude set-up would work, eventually there will be so much technical stuff to find out. We decided to let this idea rest.. for now.